Halloween is all about the costumes, and more importantly ones for kids. From witches, vampires and puppies the ideas are endless when it comes to dressing up your children, and let's face it they can be a bit overwhelming trying to decide. With a bunch of blockbuster movies this past year, most of the popular costumes feature some of your favorite movie characters, but we've also rounded up some perennial favorites for when you want to stray from mainstream. Our list covers costumes for toddlers to pre-teens and themes range from sweet to scary. So, stop the search and buy one of our top recommendations for the best Halloween costume yet. What kid isn’t obsessed with Paw Patrol? Perfect for three-to-four year olds, this jumpsuit, headpiece and backpack combo gets them dressed up as heir favorite cartoon character in a jiffy, which is ideal for active toddlers. Plus — they’ll be happy wearing their favorite TV personality, while you'll actually get your picture moment because they aren’t ripping the costume off. A win, win for both! Every girl needs to be a witch some point in her Halloween lifetime. This getup is not only stylish and sweet it also looks good. Kids sizes 2 to 4 can show off this adorable costume that comes with a long sleeve full-skirted dress and hat. If the weather is cool by you, consider layering under a black turtleneck and leggings for added warmth. To top off the look, a pair of black boots and a broom will be just the thing to get her off for flight. 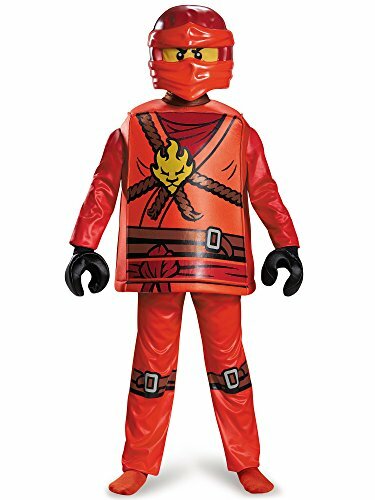 With the Lego Ninjango movie just hitting theater's now couldn’t be a more perfect time to rock this costume. Available for kids in sizes suiting 4 to 12 year-olds, this outfit covers the whole body with its constructed top and pants, half mask and signature Lego hands you've come to love over the years. Hot off being summer’s biggest blockbuster, Wonder Woman is still going strong. And there is no reason why your girl shouldn’t show off her fearlessness with this updated costume. Included in this set are the top, pants, tiara, belt with lasso and gauntlets and it has a wide range fitting most kids age 4 to 14. Your girl can add her own Wonder Womanness by adding killer kicks, and some sparkle. 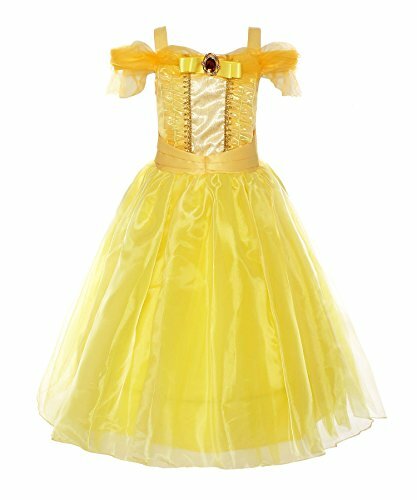 Your girl can don the yellow dress just like Belle in Beauty and the Beast with this polyester dress that has ruffled organza and off-the-shoulder straps. You can complete the look with additional accessories like a crown and gloves for the full effect. To style her hair, make sure to add lots of curls and ringlets for a true transformation. 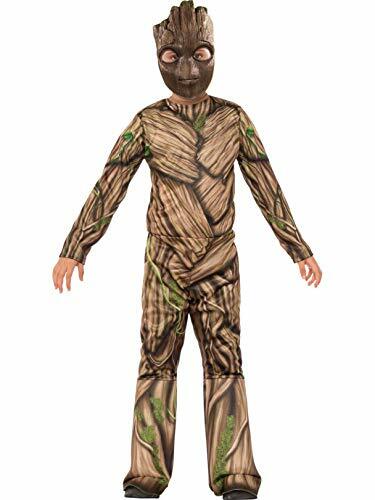 Fans of Guardian of Galaxy can dress as the adorable Groot with a jumpsuit that has an attached shoe cover and a mask to finish the look. 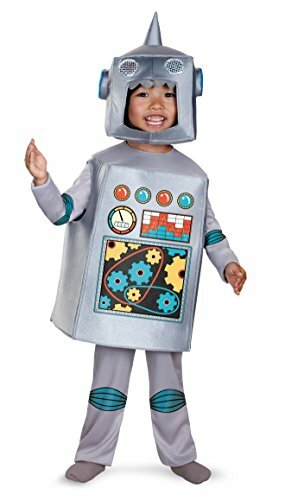 This costume fits children 44" to 60" tall so it covers a wide variety of ages. He’ll go pretty much undisguised as the dance happy tree that comes to life when music plays, with the tree like mask. In fact, why not teach him some moves he can perform when he's greeted at a neighbors door. Mermaids always seem to be a hit with little girls, and this number does just the thing while also keeping her covered up. 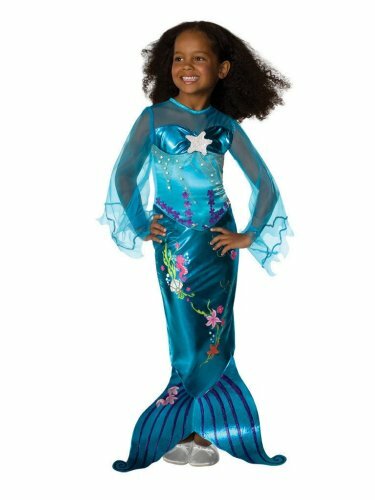 The one-piece mermaid dress has a foam tail on a printed dress giving her the complete look with just one slip over the head and it comes in sizes suitable from 2T to 10. She can also add layers underneath depending on the weather. To finish it off, add a braid to her hair or let it go long and curly for that beach swept look. This costume is bound to be one of her all-time favorites. If your kid is into tech, a robot might be a cute option for him this year. The jumpsuit with foam overlay and a headpiece fits kids age 2 to 6 and you can add leggings underneath for extra warmth when needed. They’ll get a kick out of walking and talking like an actual robot. Just be sure he unplugs before bed! If your youngster loves tools and helping others, they’ll simply adore wearing the Melissa & Doug Let’s Pretend Construction Set! 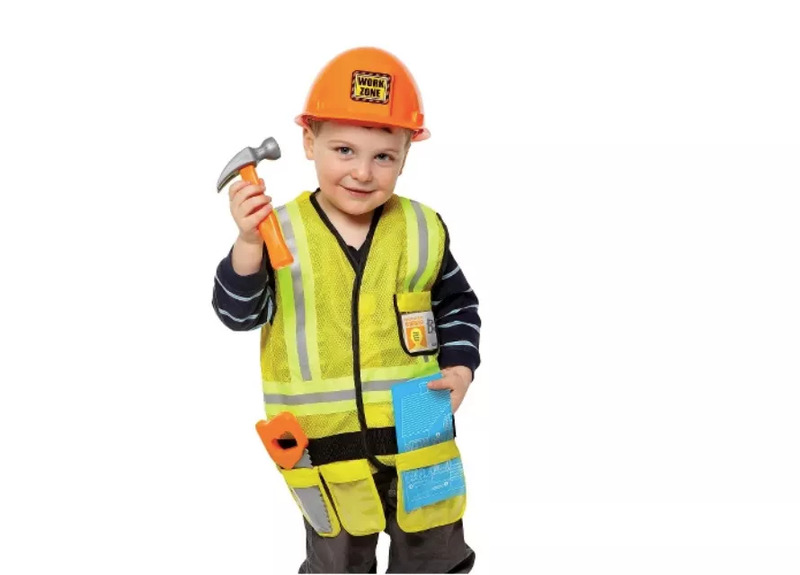 This simple yet realistic-looking outfit is all your child needs to feel like they can build and fix just about anything—a bright yellow safety vest, tiny tool belt, saw, blueprints, and hammer are all included in the set. It can also function as an outfit for creative play and dress-up after Halloween. Reviewers on Target.com love the Melissa & Doug Construction Set, thanks to its “great price and great quality."